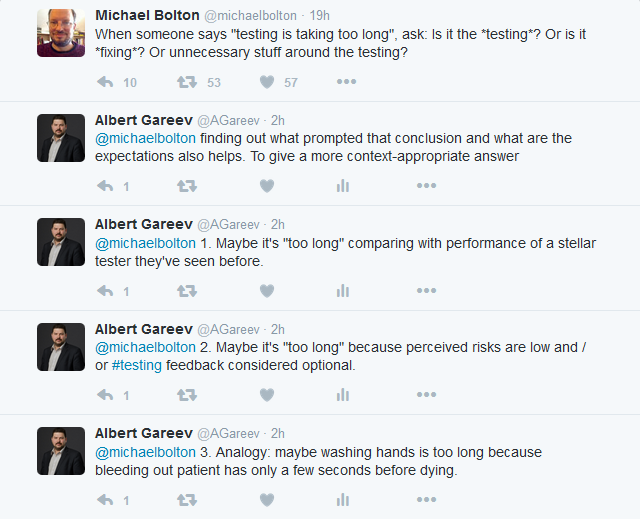 I had a quick conversation with Michael Bolton on twitter today..
Michael Bolton: When someone says “testing is taking too long”, ask: Is it the *testing*? Or is it *fixing*? Or unnecessary stuff around the testing? Albert Gareev: Finding out what prompted that conclusion and what are the expectations also helps. To give a more context-appropriate answer. Albert Gareev: Maybe it’s “too long” comparing with a performance of a stellar tester they’ve seen before. Albert Gareev: Maybe it’s “too long” because perceived risks are low and / or testing feedback is considered optional. Albert Gareev: Analogy: maybe washing hands is too long because bleeding out patient has only a few seconds before dying. Albert Gareev: Concern: it is quite possible that “comparing to what” being said this directly won’t help to have a productive conversation. ..the conversation ended with Michael’s suggestion to expand my point in a blog. This year I gave a talk “Transition to Agile in a Regulated Environment” at KWSQA conference Targeting Quality 2016. The talk was not focused on tools or methodologies. I shared my experiences in learning about the context and dealing with people – main part of the context. Dealing with people’s emotions, biases, and prejudice. And helping people to deal with their emotions, biases, and prejudice. I called a crucial part of it a “CAN approach”, where CAN stands for “connect [with a person] – appreciate [their views and their sharing] – negotiate [common ground and understanding of the problem]”. “Instead of condemning people, let’s try to understand them. Let’s try to figure out why they do what they do”. “Ask people to tell [about the project and their role], say you want to learn from them. Ask about challenges they experienced and about their accomplishments”. “Give honest and sincere appreciation”. Ignore emotional component; thank for sharing the feedback. Be agreeable. Agreeableness is a personality trait manifesting itself in individual behavioral characteristics that are perceived as kind, sympathetic, cooperative, warm and considerate. “No one likes to feel that she is being sold something or told to do a thing”. “The only way on Earth to influence other people is to talk about what they want and show them how to get it“. “When we have a brilliant idea, instead of making others think it is ours, why not let them cook and stir the idea themselves. They will regard it as their own; they will like it”. “Cooperativeness [..] is achieved when you show that you consider the other person’s ideas and feelings as important as your own”. So that was my point. When someone imposes a judgment, going defensive or offensive is not necessary, and often it doesn’t help. Instead you can show a sincere interest and desire to learn about their concerns. After all, it is in your interest to reach the mutual understanding in order to get the question addressed. When it comes to “too long”, there’s also a general pattern. When people perceive something as “going too long” what they actually experience is not knowing what’s going on. Hmm.. is there anything we can do on a testing side to address that perception? Upfront and through communication, maybe? One response to "Defusing a judgment? Yes, you CAN: Connect -> Appreciate -> Negotiate"
Once again, all excellent points. Notice, too, that I was agnostic about whom we should ask. A great start—one that leads to more productive connections, appreciations, and negotiations—is to prepare yourself with possible answers to the questions. I believe, no matter how many answers we know (we think we know!) there is a room for humbleness.